Since there is no magnetic resistance applied to the vibration system, the tip of the needle can move smoothly. This is the first merit of the principle of optical cartridges. To detect music signals, the MM / MC cartridge must move the magnet or the core and the coil. However, in the case of optical cartridges, it is only necessary to move a light shading plate with a thickness of only 100 microns, so the execution mass is extremely light. This is the second principal merit of the optical cartridge. ・What is the detection principle of the optical cartridge? We will explain the detection principle of the optical cartridge in more detail. 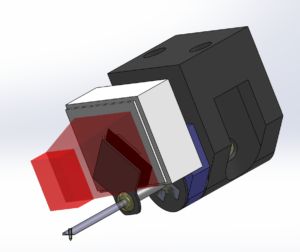 The optical cartridge detects movement of the needle using infrared LED, light shielding plate and two PD (solar cells). The operating principle is simple, the shading plate vibrates in front of the LED, and the PD (solar cell) behind it detects the change in brightness. We will explain how to independently detect L and R channel signals from one shading plate. The photo on the right is a view of the light shielding plate and the solar cell from the position where the LED is located. 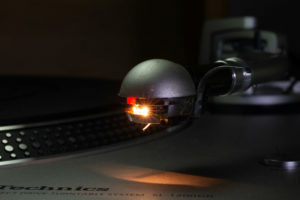 When the groove of the record vibrates (oblique 45 degrees), the vibration is transmitted from the tip of the needle to the cantilever, and the shading plate also vibrates together. Since the shading plate vibrates in such a way as to block the light of the front LED, the brightness entering PD (solar cell) changes continuously from bright → dark → bright → dark. And PD (solar cell) outputs change in brightness = record groove movement as a voltage change. At that time, since the brightness of the solar cell does not change because the motion of the light shielding plate becomes a parallel movement on the side of the reverse PD (solar cell) side, it is possible to detect audio signals of the left and right channels with one light shielding plate. This basic detection principle is exactly the same as the photoelectric cartridge 40 years ago. The important point here is that the output of the PD (solar cell) is the Pure analog sound because the movement of the shading plate = the motion of the record board is output as a voltage change. It is NOT Digital Sound. With an optical cartridge, you can not use a phono equalizer for MM / MC, you must use a phono equalizer dedicated to the DS Audio optical cartridge. The reasons are two reasons. Power is supplied to the LEDs of the optical cartridge using the tone arm ground (blue and green lines). For that reason, in order to use the optical cartridge, it is essential that the four cables of the tone arm are properly independent. Because the output of the MM / MC cartridge is proportional to the speed, the output increases as the speed rises (= higher frequency). 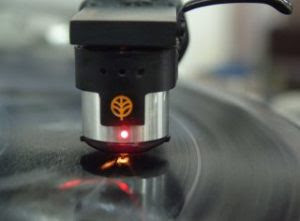 However, the optical cartridge is an amplitude proportional type output that outputs the change of groove of the record as it is, it outputs flat from the low frequency to the high frequency (same as the old crystal type and capacitor type). Since the optical cartridge classified as amplitude proportional type has different output form from MM / MC cartridge which is speed proportional type, even if the same record is read, it is totally different output. Therefore, the RIAA correction circuit for the amplitude proportional type cartridge and the RIAA correction circuit for the speed proportional type cartridge become different. The amplitude proportional type optical cartridge can output the movement of the groove flat from the low frequency to the high frequency, so the RIAA correction circuit of the optical cartridge becomes an overwhelmingly simple circuit compared to the RIAA correction circuit of the speed proportional type. The RIAA correction circuit of the optical cartridge becomes an overwhelmingly simple circuit. This is also big merit of the optical cartridge. As you probably know, some photoelectric cartridges have been commercialized from Toshiba, Sharp, Trio, Kenwood etc over 40 years ago. The reason why the optical cartridge once commercialized disappeared is that in the 1970s, it is the biggest factor that the development resources of major companies have shifted from analog to CD. In addition to that, there was one problem that could not be overcome in the past optical cartridges by any means. That is a problem of “Heat”. Forty years ago from now, there is no LED as it is now, there were only lights available for light cartridges for light cartridges. When this lamp was made to shine, a large amount of heat was released and the heat warmed the damper rubber of the cartridge, so that the damper rubber became more and more softened over time, and the compliance was changed. In order to overcome this problem, each company seemed to have taken various measures, but the optical cartridge disappeared without finding the fundamental solution. 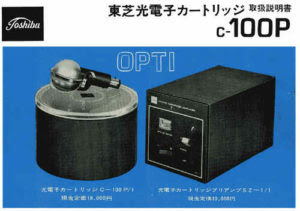 However since this time the clean and fresh sound quality itself of the optical cartridge released from magnetism has been highly appreciated and has been handed down as a “legendary machine” for over 40 years since then. Here, why DS Audio was able to restore the optical cartridge after 40 years, the biggest reason is that the device has greatly evolved in both the issuing element and the light receiving element in 40 years. Today, unlike 40 years ago, the problem of “Heat” does not occur because very small and high power LED can be used. And since it uses a highly sensitive photodiode with its sensitivity characteristics well matched to the wavelength of the light source, it is possible to take out a very high output (about 40 mV). The optical cartridge is about 40 mV, which is about 10 times to 100 times higher than MM / MC cartridges, so high output can be obtained, so it is also one of the merits that there is no need to pass inside the tone arm with a weak current.